It’s awesome to hear stories of why you chose to drink Two Chimps Coffee. In Katrina’s case, she was in need of a good decaf coffee. She chose our Swiss Water, Decaffeinated Coffee to drink whilst she was pregnant. We asked her what she thought, why she chose our decaf, and to share other changes she chose to make throughout her pregnancy with you all. One of the things talked about most when you’re pregnant is food and drink. People would often remind me that i’m eating for two. I interpreted this to mean choosing food that benefits me and my baby rather than the need to eat more. What you should and shouldn’t eat whilst pregnant is a minefield. Especially at a time when you’re exhausted, nervous and nauseous. The NHS site is a great resource for understanding what you should and shouldn’t eat. “Expecting Better” by Emily Oster, which reviews the studies that informs official guidance, was also a great point of reference. I like to understand what is behind the guidance before I make informed decisions. The key when you’re eating for two is to have a healthy, balanced diet. Avoid foods that may cause harm to your unborn baby. The Indulgence in a guilt-free piece of cake or a pudding every now and then however, is a pregnancy perk to be enjoyed! – I developed an aversion to adding milk to hot drinks! I also switched from regular builders tea to rooibos tea. – Chocolate actually has caffeine in it. By forgoing caffeine elsewhere meant I could have some squares of dark chocolate without having to work out how much caffeine I’d already consumed. Winner! – No more cured meats or soft cheeses – this was the hardest part for me I must say. I didn’t have to cut pate out of my diet however as I didn’t like it anyway. Oddly I do enjoy it now! – Avoiding Sushi was something I chose to do. The guidance on what was ok to eat just wasn’t clear enough and to be honest, I was too tired to have to think that hard. – I decided not to drink alcohol at all during my pregnancy. I was aware that a glass of wine each week would be ok, but I found that I didn’t really fancy it. The biggest change of all, I had to find a good decaf coffee. I had to reduce my caffeine intake; I understood that some caffeine is ok, but decided to cut it out of my drinks completely. This meant forgoing my daily Diet Coke (sob) and switching my daily latte to a decaf Americano. 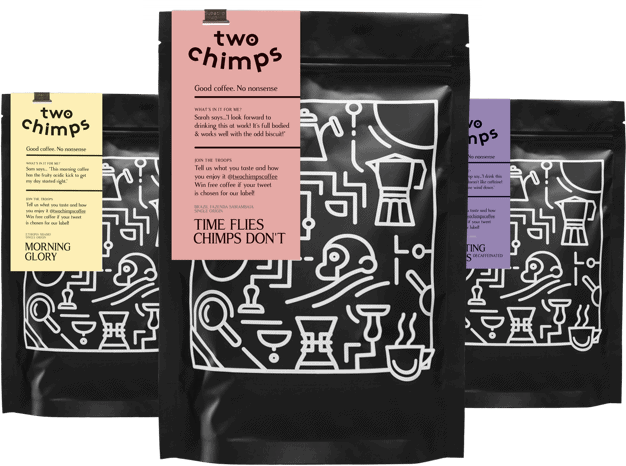 When I found ‘Counting Chimps’ Decaffeinated coffee through the online shop, I started reading about it and I knew it was the one for me. As I said, being careful about what you put into your body when you are pregnant is really important. Knowing that the decaffeinated coffee from Two Chimps is made using a Swiss Water process and is 100% chemical free certainly put my mind at rest. This coffee is also certified by the Rainforest Alliance too – bonus! I ordered my first bag and loved the taste. It was sweet and creamy and to be honest, I couldn’t really taste the difference from caffeinated coffee. Hurrah – a really good decaf coffee I could enjoy and make at home. I even made it for my friends and family when they popped round and no one could tell the difference. Sweeet.